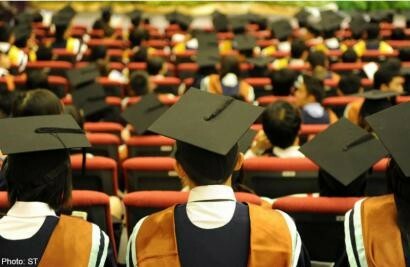 SINGAPORE - Around one in two university undergraduates said that they will stay in their first jobs for two to three years, revealed a survey by employer branding firm Universum. Another 6.3 per cent of the 7,294 students queried said they expect to work for their first employers for only one year or less, while 8.8 per cent said they would work in their first jobs for four years. Among the respondents, 33.4 per cent expected to have a longer tenure of five years or more, showed the findings released yesterday. Human resource experts MyPaper spoke to said it was not unusual for undergrads to have a short stint at their first jobs. Mr Michael Smith, Randstad country director of Singapore,said the first job is seen by undergrads "as a platform to gain experience and develop the necessary skills required to advance their careers". "Gen Y workers tend to stay in jobs for much shorter tenures than their parents did, as they continually seek a strong and meaningful workplace culture," said Mr Smith. Mr Mark Hall, vice-president and country manager of Kelly Services, said employees consider the experience gained with multiple employers an asset with which to develop their careers. They work with multiple companies in the "infancy of their career" to pick up a wide array of skills, with the perception that it will lead to better opportunities. Ms Madeline Koh, 20, an environmental engineering student at the National University of Singapore, said: "I'll want to get a range of experiences... The job must (also) be able to hold my interest throughout my time there."